1. Two candles of same height can burn completely in 7 hrs and 9 hrs respectively. If both are lighted at same time, then find after how much time ratio of their height become 3 : 4 ? 2. Javed can type 20 lines in 10 minutes but he leaves 8% margin in each line. In how much time will he type 23 pages with 40 lines on each page leaving 25% more margin than before ? 3. In how many ways, the letters of word ASSASSINATION can be arranged so that the words always start with A and end with N? 4. A car covered a certain distance at a uniform speed. If the car had been 6 km/h faster, then it would have taken 4 hours less than the scheduled time. If the car were slower by 6 km/h, then the car would have taken 6 hours more than the scheduled time, then find the length of the journey. 5. Shyam went to the market to buy 10 kg of each of oranges, mangoes, bananas and grapes. The cost of 5 kg of oranges and 2 kg of mangoes together was Rs.310. The cost of 3 kg of mangoes and 3.5 kg of bananas together was Rs.230. The cost of 1.5 kg of bananas and 5 kg of grapes together was Rs.160. Find the total amount spent by Rohan. 6. P can do a piece of work in 18 days and Q can do the same work in 12 days. P and Q starts the work together but after 3 days, Q leaves the job and R join with P. P and R complete the remaining works in 3 days. If for complete work Rs.24000 has been given, then what amount is received by R? 7. Priti bought a bag with an additional 20% discount on the reduced price after deducting 10% on the labelled price. If the labelled price was Rs.1600, then at what price did she purchase the bag? 9. Sunita driving her car at a speed of 45 km/hrs reaches her college 14 minute late. Next time she increase her speed by 5 km/hrs but finds that she is still late by 8 minutes. What is the distance between her college and her house? 10. In a bag there are 4 red, 5 green and 6 pink balls. 3 balls are drawn one by one. If the first ball comes out to be of red, then 6 more red balls are added to bag. After the Second draw no new balls are added to bag. Find the probability that all the 3 balls drawn are of red. 1. 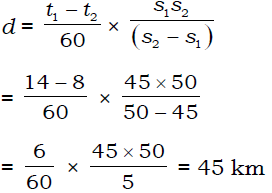 B) Let the length of candles be 1 unit and after t hours, the ratio of their length be 3 : 4. 4. C) Let the speed of Car be x km/h and actual time taken is t hrs. 5. A) Let the price per kg of Orange, Mangoes, Bananas and Grapes be Rs.O, Rs.M, Rs.B and Rs.G respectively. 6. C) P do the work for 3 days + 3 days = 6 days, Q work for 3 days and R work for 3 days. So, Sunil cover 32.5 m in 10 sec. Due to withdraw of one red balls now there are only 3 red balls is left. Also, there is no replacement done so, total number of balls becomes 14. Hence, 24/475 is the probability of all the 3 balls drawn are of red ball.